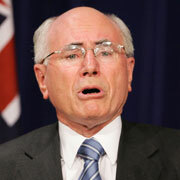 Australian Prime Minister John Howard is out, suffering a humiliating re-election defeat after four terms in office. I only wish his refusal to support Schapelle Corby as she rots in an Indonesian prison for 20 years following her conviction for importing 4 kilos of pot in a boogie board played a part. “ I feel for her. I understand why there's a lot of public sympathy for her; I would simply say that I hope justice is done and it's a fair and true verdict...I would ask the rhetorical question: My fellow Australians, if a foreigner were to come to Australia and a foreign government were to start telling us how we should handle (it), we would react very angrily to that."